View – view mode. “For Sale” or “All”. Default view mode is “For Sale”. “For Sale” mode displays for you only statistic for Places marked as “For Sale”. 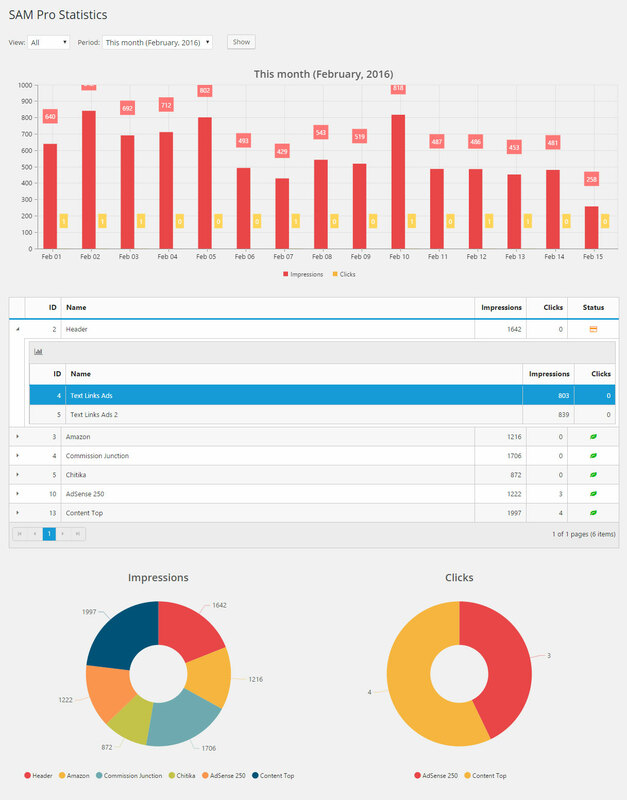 “All” mode – full statistics of advertisements on the site. Period (month/year) – Select the period for which data you want to see. Advertiser – Select “All” or the advertiser for which data you want to see. Show – Click this button to apply the entered data. 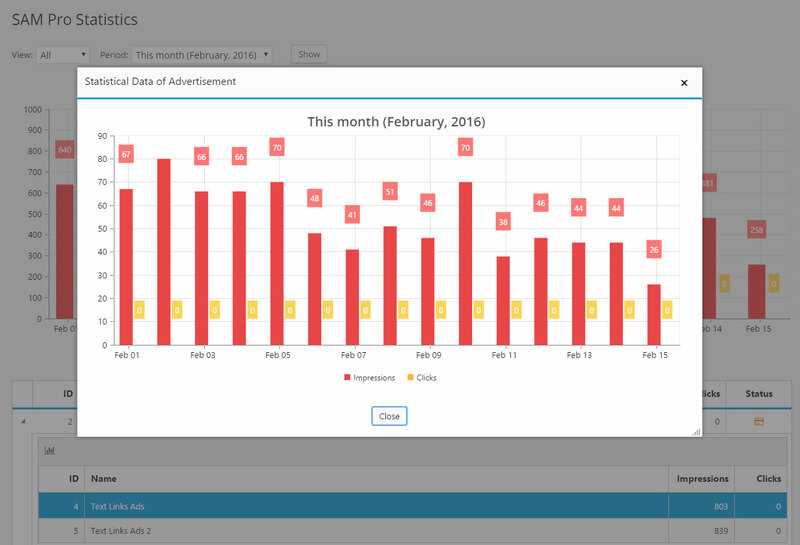 – Show statistics for selected ad. In order to make this button available, you must select an ad in the child grid. In statistics I cannot see the impressions and clicks of each add separately. I can see the top chart with the the impressions for a whole period, but not the list of ads I used. If there are ads in rotation on the same place, how can I see the stats separetely? I’m comparing the stats of a banner on homepage with analytics and data is not same, do you know why this happens? Just wondering if its possible to have pop up graphics with your plugin? Possibilities to disable statistics from logged in users/several IPs? I have just installed the Sam Pro (free). It seems to be working well, but I really don’t understand the setting for Views per Cycle. Mine is set at 1000. Is it good or bad? All my ads in rotation have the weight of 10. How do I determine what Views per Cycle value is the best for me? Does changing this value affect the total Monthly statistics for each ad? The best value is the average number of visitors per day. When I view the statistics page, the number that appears above the highest value on the bar graph is cut off. This makes it difficult to see an accurate daily count. Perhaps there’s an issue when rendering the HTML5 canvas for the graphic? For your reference, I’m using version 1.9.3.59 and this is occurring in multiple browsers. In statistics the number of page views in Google Analytics is not the same as in the impressions of the plugin. Which may be due? Google Analytics is a powerful center of traffic analytics. 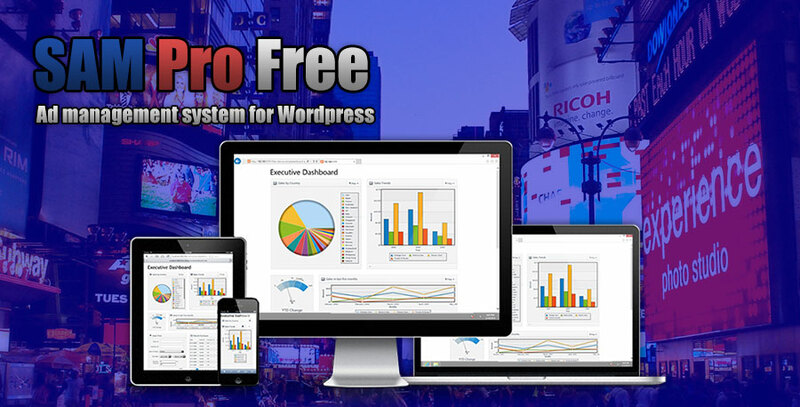 It uses a set of sophisticated algorithms to provide reliable data about visitors to your site. 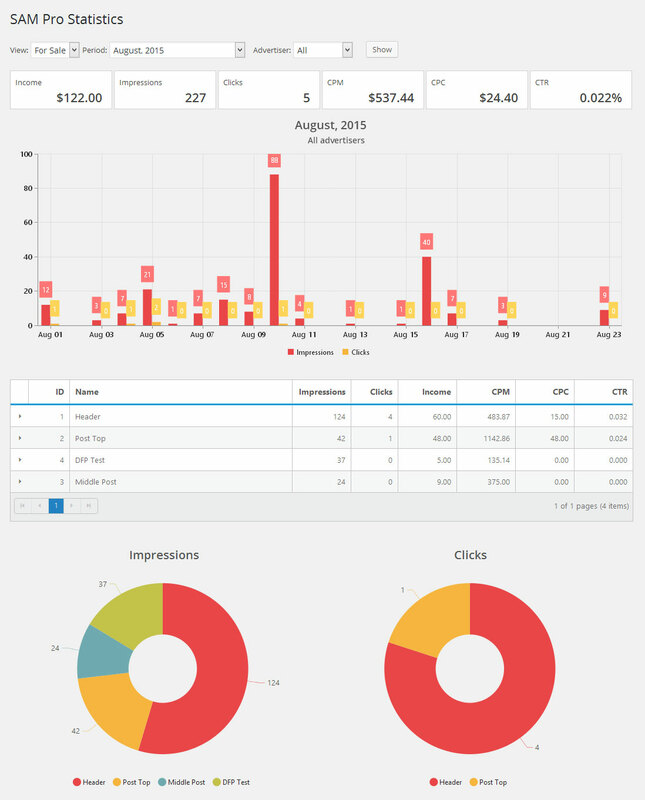 My plugin uses simple algorithms, so the final figures in the reports may differ from Google Analytics. To obtain the most accurate data, use the method “JS” for determination bots and crawlers. Thanks. I already have it configured with JS. I have two ad blocks (in addition to rotating ads) and I can’t see the statistics for the ads in these blocks anymore? We upgraded to Sam-Pro in July and I could see the stats in July & August but when I looked in September they were no longer showing? I can see the stats for all the other ads on the site, just not these ones.